Fresh Transfer Compared to Primary Frozen Embryo Transfer (FET): Retrospective Analysis of Demographics, Cycle Characteristics and Implantation, Pregnancy, and Live Birth Rates. OBJECTIVE: In light of advancing technologies enabling improvements in embryo cryopreservation, FET have increased in frequency and may now offer benefits over fresh transfers, potentially simulating a more natural uterine environment for implantation, while reducing potential risks associated with fresh transfer. 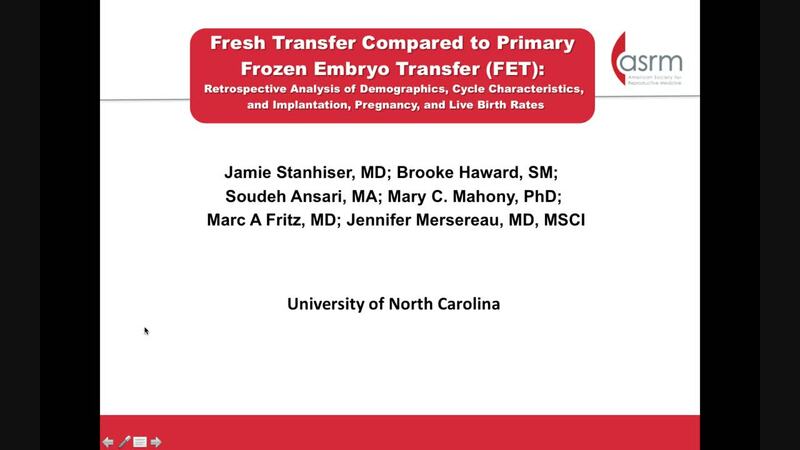 This analysis compared cycle characteristics that lead to fresh transfer versus freeze-all followed by FET as well as resulting implantation rates (IR), pregnancy rates (PR) and live birth rates (LBR). DESIGN: Retrospective cohort analysis of a large real-world database including 15 clinics across the US with patients from all 50 states. MATERIALS AND METHODS: Autologous IVF cycles from 2013-16 with fresh transfer or in which all embryos were frozen were included from the IntegraMed America, Inc. network database. Cycles implementing preimplantation genetics screening were excluded. PR and LBR after fresh vs. primary FET were analyzed by age categories. RESULTS: A total of 46,255 cycles were analyzed: 33,664 fresh and 12,561 freeze-all (9,237 with primary FET). Compared to women who underwent fresh transfer, primary FET patients were more likely to be older, with higher Antimüllerian hormone (AMH), and higher levels of estradiol and progesterone on the day of trigger (Table, all p<0.0001). On average 2 more oocytes were retrieved in cycles resulting in all embryos frozen than in fresh transfer cycles. Fewer embryos were transferred after thaw, however IR were higher in primary FET than in fresh transfers. Across all age groups, FET patients had ≥11% increase in IR and PR, and ≥7% increase in LBR (Table, all p<0.0001). CONCLUSIONS: This analysis shows that patient and cycle characteristics are significantly different for primary FET compared to primary fresh transfers. While pregnancy and live birth rates were higher after FET across all age groups, further analysis is needed to also adjust for patient/cycle differences in AMH, diagnosis and hormone levels. Additional analysis is indicated to clearly delineate which subsets of patients most benefit from primary frozen vs fresh transfer. AMH, Antimüllerian hormone; LBR, live birth rate; FET, frozen embryo transfers; SART, Society of Assisted Reproductive Technology; SD, standard deviation. * p<0.0001. P-values for comparison of fresh vs. frozen cycles from t-test (for age and AMH) and chi square test (for all other comparisons). aLive birth rates were limited to cycles starting before January 1, 2016, to allow for transfer and follow-up of birth results.